"An earthquake swarm occurred by surface faulting on 21 April in the Chinameca Complex, near Tecapa, a volcano with no known historic eruption. A magnitude 4.7 (mb) earthquake, the largest so far, occurred on 23 April . . . . Four days later, 27 April, during the peak activity (in terms of numbers of recorded and felt events per day), an 8 km-long graben formed on the NW flank of the volcano. The N40°W-striking graben is 0.8-1 km wide, with a vertical offset of 30 cm. Through 6 June, 170 earthquakes were felt in the area. A very preliminary analysis of the earthquake location data implies that activity began on a tectonic fault some 15 km NW of the volcanic summit, and moved nearer to the volcano at the time the graben formed. Since 3 June, 5-20 earthquakes per day were recorded by a high-gain seismograph station 50 km from the volcano, down from 300 events per day on 26, 27, and 28 April, and 21 and 23 May." Information Contacts: J. González, Centro de Investigaciones Geotécnicas, San Salvador; D. Harlow, USGS. The Global Volcanism Program has no Weekly Reports available for Tecapa. Tecapa is a complex basaltic-to-andesitic stratovolcano at the NW end of a cluster of volcanoes E of the Río Lempa between San Vicente and San Miguel volcanoes. The Berlín caldera, whose rim is visible on the W side of the complex, was formed during the eruption of the Blanca-Rosa dacitic pumice in the late Pleistocene. 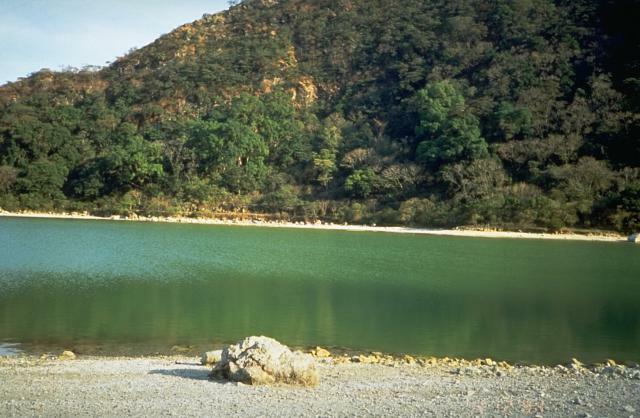 Following caldera formation, the cones of Cerro Las Palmas, Cerro Pelón, Tecapa-Laguna de Alegria, and Cerro Alegria were constructed along a WSW-ENE line. The crater of Tecapa-Laguna de Alegria contains a deep notch on the eastern rim and is filled by Laguna de Alegria crater lake. The volcanic complex currently displays fumarolic activity, and a producing geothermal plant is located at the Berlín geothermal field. Anderson E B, Jacobo H R, Ussher G N H, 1994. The Berlin geothermal system; from the surface to the magma chamber?. Proc 16th New Zeal Geotherm Workshop, Auckland, 16: 127-132. 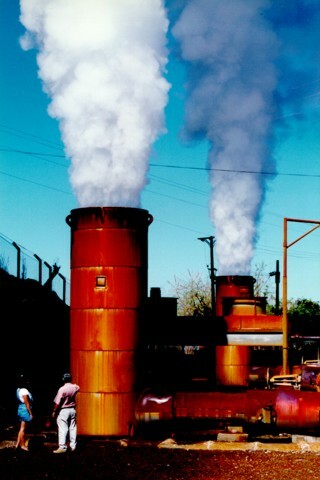 Comision Ejecutiva Hidroelectrica de Rio Lempa (CEL), 1994. Campo Geotermico de Berlin. Inf Invest Geovulcanologicas Adicionales, unpublished rpt, 51 p.
Parini M, Pisani P, Monterrosa M, 1995. Resource assessment at the Berlin geothermal field, El Salvador. Proc World Geotherm Cong, 3: 1537-1542. Rodriguez J A, Herrara A, 2003. 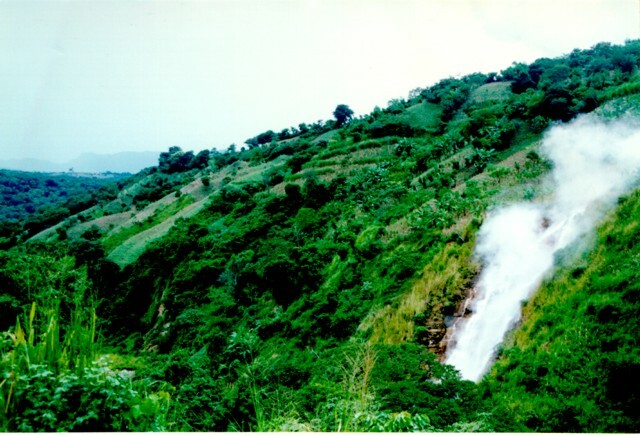 Geothermal El Salvador. Bull Geotherm Resour Council, 32: 159-162. There is no Deformation History data available for Tecapa. There is no Emissions History data available for Tecapa. The summit of Tecapa volcano contain a 600-m-wide crater lake, Laguna de Alegría. The 0.9 x 1.3 km wide crater, seen here from the west, is elongated in an E-W direction and lies about 300 m below the summit. A drill rig towers above a well site at the Berlín geothermal area. 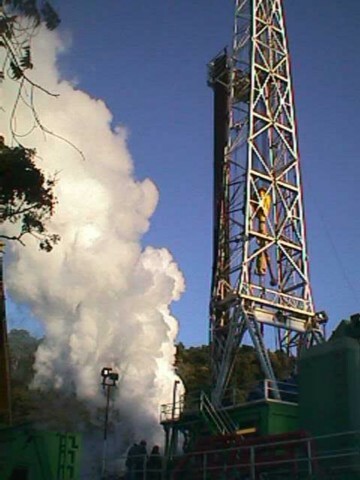 The first exploratory well at Berlín was drilled in 1966 by the government of El Salvador, with assistance from the United Nations. Feasibility studies in the early 1980s were halted by the civil war, and production testing of wells was not completed until 1987. The first two 5 MW power plants came on line in 1992, and 25 MW wells at the Berlín 2 site went into operation in 1998 and 1999. Photo courtesy of Comisión Ejecutiva Hidroeléctricia del Río Lempa (CEL). Steam clouds rise above El Tronador, a natural fumarole along the lushly vegetated slopes of the Berlín geothermal area. El Tronador fumarole has measured temperatures of 105-107 degrees Centigrade and begins condensing within 5 m of the fumarolic vent. The intensity of fumarolic activity at Tecapa has not varied during historical time. The Berlín geothermal area in the center foreground is viewed from the SE on the flanks of the Tecapa massif. 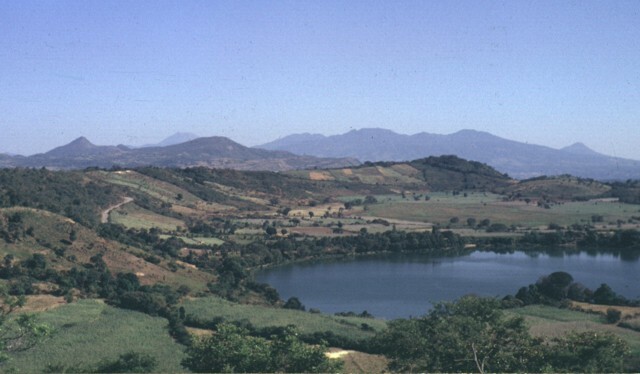 The Pan-American highway traverses the base of the Tertiary volcanoes of Cerro Sihuatepeque (center) and Cerro Palacios (left) across the Río Lempa in the background. 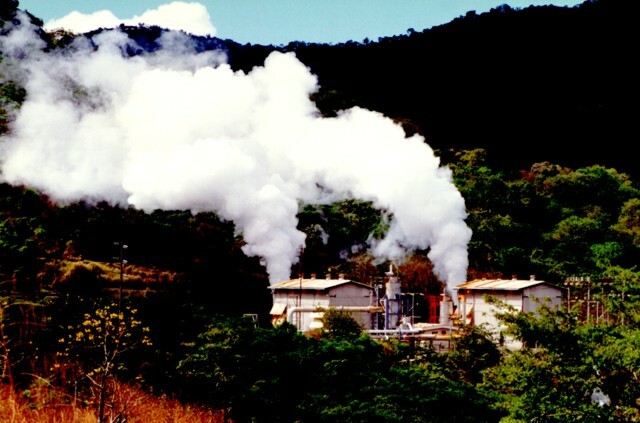 The Berlín geothermal field is one of 7 areas of geothermal investigation in El Salvador. 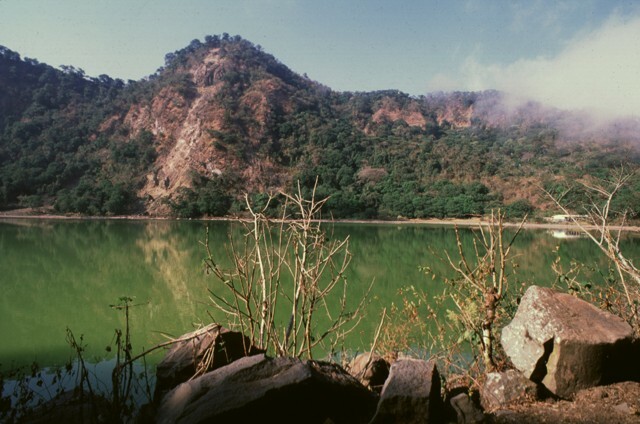 Laguna de Apastepeque in the foreground is one of two lake-filled phreatic explosion craters in the Apastepeque volcanic field. The broad range in the distance on the right-hand horizon to the SE is the Tecapa massif. At the far right is the sharp peak of Volcán Taburete. San Miguel volcano can be seen on the left-center horizon behind the ridge in the middle ground. Laguna de Alegría is seen here from the summit of Tecapa volcano, looking SE with the town of Santiago de María in the background. The 600-m-wide crater lake lies about 300 m below the summit. Santiago de María is situated at the eastern end of the Tecapa volcanic complex, on the 900-m-high saddle between it and Cerro El Tigre volcano. 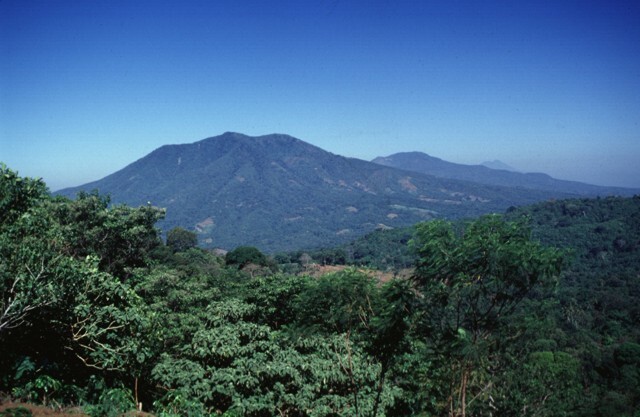 The slopes of the young cone of Cerro Oromontique, constructed on the flank of El Tigre volcano along a NW-SE-trending fissure between Tecapa and El Tigre, rise immediately to the right of the town. 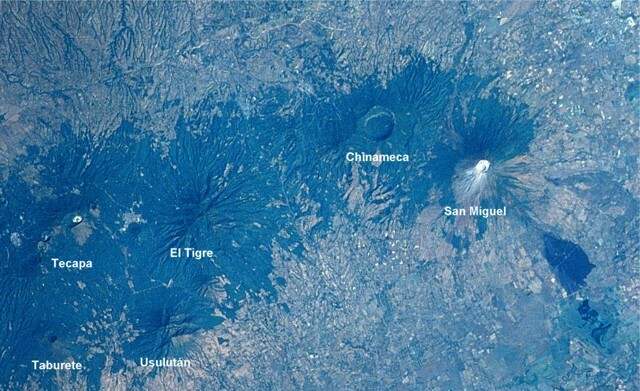 A westward view down the axis of a cluster of volcanoes between San Miguel and San Vicente volcanoes shows the eroded Pleistocene Cerro el Tigre volcano at the left and flat-topped Tecapa volcano to its right. San Vicente volcano can be seen in the far right distance. Steam pours from twin silencer towers at the Berlín 2 geothermal site. Geothermal fluids can flow from a well at the speed of sound, which resembles that of a jet engine to the field crew. The silencer drops the sound to a dull roar. Two 25 MW power plants came on line at Berlín 2 in 1998 and 1999. The two plants utilize both production and reinjection wells, and were expected (after operating and financial expenses) to save $56,000 in fuel costs per day. Steam clouds pour from the Berlín 2 well. 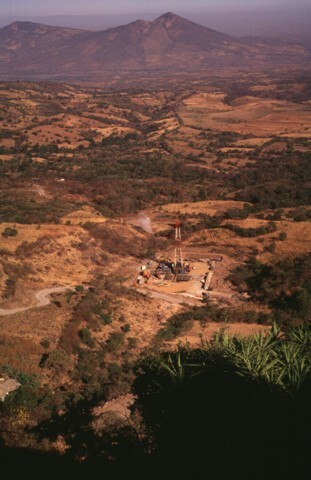 The Berlín geothermal field on the NW flank of the Tecapa volcanic complex is one of the largest in El Salvador. The Berlín 2 site has an installed capacity of 55 MW with a potential of 55-150 MW. Measured well temperatures ranged from 240-300 degrees Centigrade. 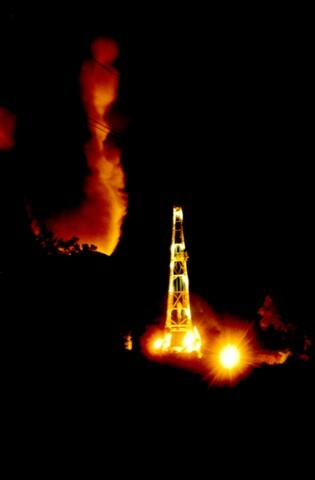 A night-time view shows a drill site at the Berlín geothermal area on the NW flank of Tecapa volcano. The Berlín Boca Pozo 1 site has an installed capacity of 10 MW and came on line in 1991. The El Tronador site began commercial operation in 1992 and generated 8 MW of power. The peak of Loma San Juan (left-center) lies along the northern crater rim of Laguna de Alegría, a crater lake at the summit of Tecapa volcano. Solfataras found along the rim of the crater lake have a maximum temperature of 94 degrees Centigrade. An area of hydrothermally altered clay containing up to 45 percent sulfur is found around the crater lake. 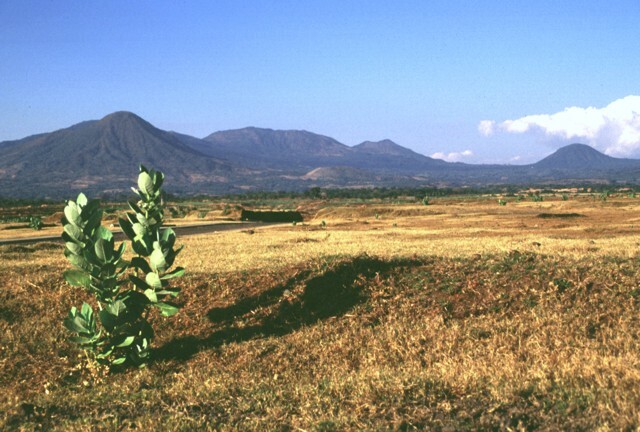 Tecapa is a complex stratovolcano at the NW end of a cluster of volcanoes in eastern El Salvador between San Vicente and San Miguel volcanoes. It is seen here from the west, across the Río Lempa, which is hidden behind the flat area in the foreground. The peaks on the far left horizon lie behind the Berlín caldera, whose rim is visible on the west side of the complex. The Tecapa volcanic complex currently displays fumarolic activity, and a producing geothermal plant is located at the Berlín geothermal field. The Tecapa volcanic complex (left) and Volcan Taburete (right) are separated by a 800-m-high saddle. They are seen here from the SW rising more than 1100 m above the Pacific coastal plain and lie at the eastern end of a volcanic chain reaching to San Miguel volcano. A relatively young lava flow is found on the southern flank of Taburete volcano, although its age is not known precisely. Fumarolic activity continues at Tecapa, the site of a major geothermal project. 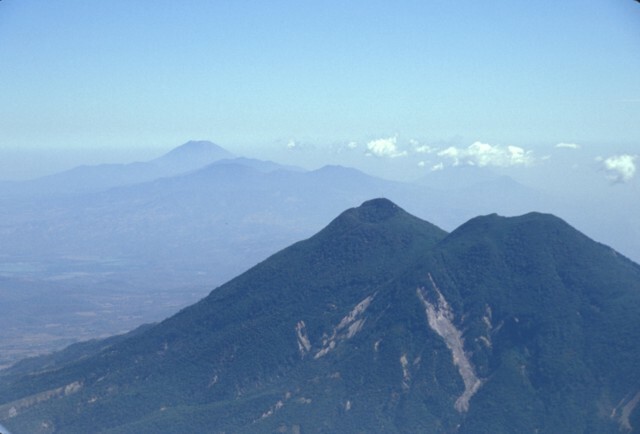 Rounded Volcan Taburete (left) and the compound Tecapa volcanic massif rise to the NW above the Pacific coastal plain of El Salvador. The small cone of Loma Pacha on the lower SE flank of Taburete (visible in the center of the image) produced a thick lava flow that traveled to SE. The rounded peak at the extreme right is Cerro Oromontique, a cone erupted along a NW-SE-trending fissure on the flank of El Tigre volcano. 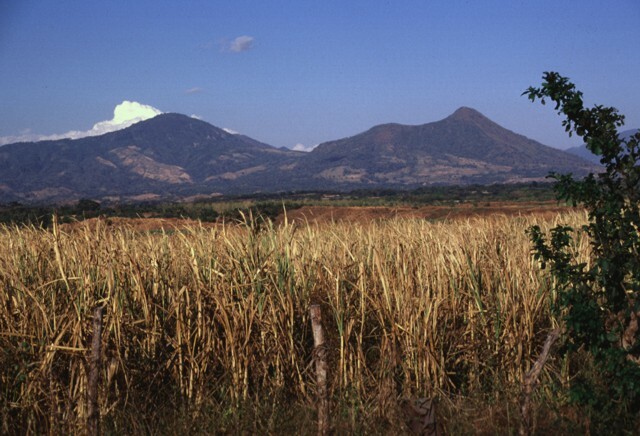 The Tecapa volcanic complex (left) and Volcán Taburete (right) rise to the east across the Río Lempa, which is hidden beyond the slope in the foreground. 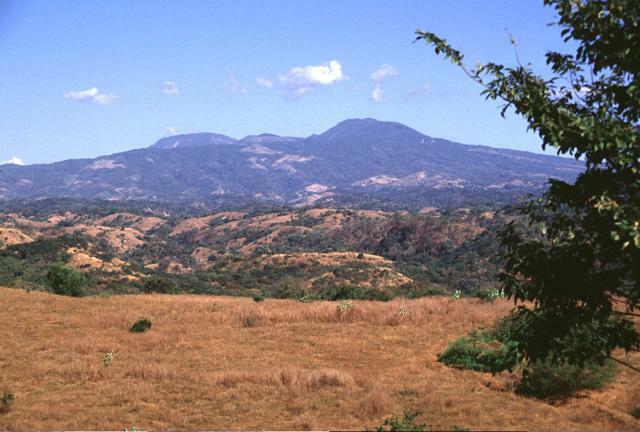 These peaks lie at the western end of the 40-km-long Tecapa-San Miguel volcano cluster in eastern El Salvador. Ignimbrites from a caldera-forming eruption at Tecapa reached across the Río Lempa. An E-W-trending chain of volcanoes extends ca. 30 km across eastern El Salvador. The small light-colored dot at the left is Laguna de Alegria, a crater of the Tecapa volcanic complex. 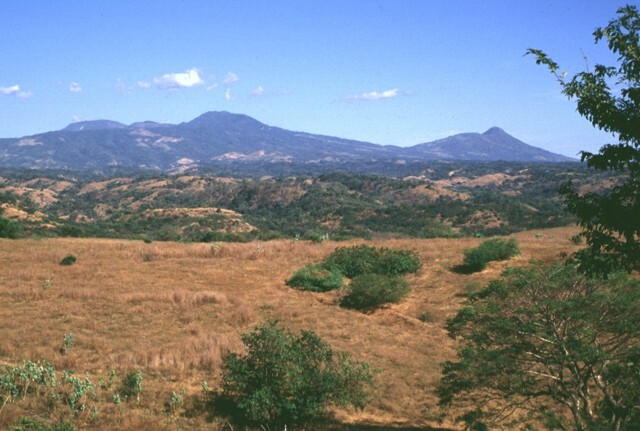 No historical eruptions are known from the eroded Usulután and El Tigre volcanoes. 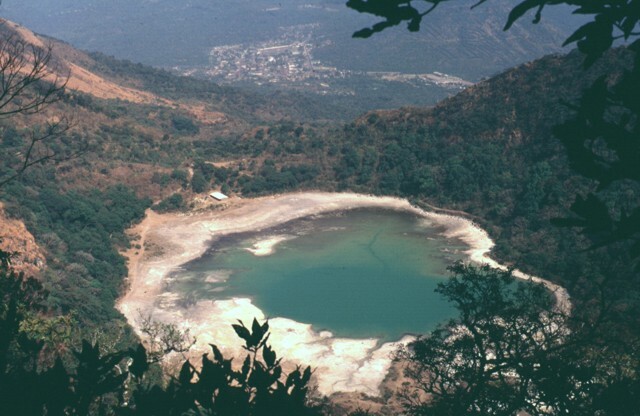 The 2-km-wide Laguna Seca el Pacayal caldera is a prominent feature of Chinameca volcano. San Miguel is one of El Salvador's most active volcanoes; the dark area at the lower right is a lava flow from the 1819 eruption. The city of San Miguel is at the upper right. NASA Space Shuttle image STS61C-31-47, 1986 (http://eol.jsc.nasa.gov/). There are no samples for Tecapa in the Smithsonian's NMNH Department of Mineral Sciences Rock and Ore collection. Large Eruptions of Tecapa Information about large Quaternary eruptions (VEI >= 4) is cataloged in the Large Magnitude Explosive Volcanic Eruptions (LaMEVE) database of the Volcano Global Risk Identification and Analysis Project (VOGRIPA).